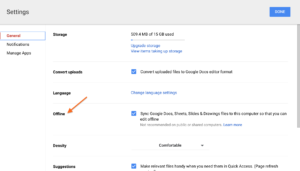 Are you making the most out of Google Drive? When I first started using it, I wasn’t. I’d load it up and use it as an online-only Microsoft Word Equivalent and barely scratched the surface. Yet Google Drive is packed with hidden functionality. That’s why I’d like to share five of my favorite, not-so-obvious Google Drive Features. One of the biggest challenges of cloud-based services like Google Drive is the online connectivity issue. What if your wi-fi is down? Or you need to draft a blog post during a long flight without paying the extortionate airplane wi-fi fee? With the Google Drive offline extension, lack of wi-fi is not a problem– you can access G-Docs wherever you are. Head over to the Chrome store and download the extension. After you’ve installed it, go to your Google Drive and open up Settings. Under the Offline section, check the sync box. This will sync your Google Drive to your computer. Now all your docs are available offline. Any changes you make offline will then be synced next time your computer goes online. But what about when you’re travelling with just your phone or tablet? 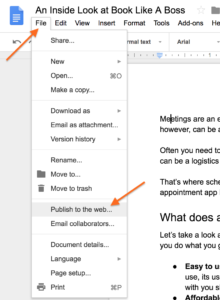 To access a Google Doc offline on your phone or tablet, open the document you’d like to use and click on the three dots in the top right-hand corner. 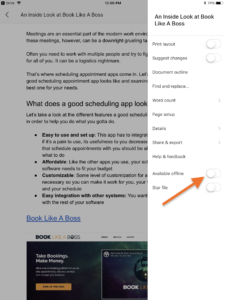 In the document menu, toggle “Available offline” on. Now you’ll be able to work on your doc on the train, plane, or automobile– as long as someone else is doing the driving! Did you accidentally delete the latest version of that document you’ve been working on? Back in the dark days of manual saves and dial-up internet, losing the document you spent hours working on was excruciating. Luckily, those days are behind us. 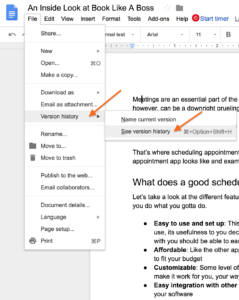 To access a previous version of a document in Google Docs, go to File and click on Version history. Google will show you all the previous versions– find the right one and restore it in seconds. Every time I try to type “the”, my fingers hit the “e” before the “h”. 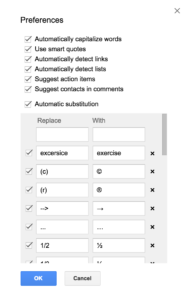 Google Docs offers up a simple fix to this. Head over to Tools and select Preferences. Here you can set your preferences to transform a certain word or symbol into a specific format– so “teh” becomes “the”. If you make the same finger-slip error over and over, set up an automatic replacement so any slip gets replaced with the right version before your fingers leave the keyboard. 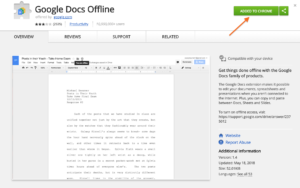 Google Docs is a cloud-based service so every document you work on has a web address. This makes publication really easy–you can publish the address online and allow people to access it. Open the document you’d like to publish. 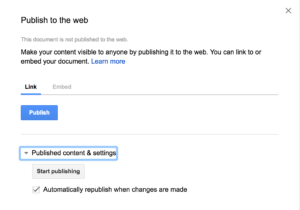 You can publish a link to the document or embed it in a web page. Once the doc is published, use the URL to send visitors to a web page that has the latest version of a document you’re working on. Any changes you make to the documents get made in real time. You can edit your Google Drive and any of the accompanying apps straight from your phone– simply download all the apps for free from the app store. While your phone isn’t the best place for a full-on edit, it’s handy to be able to access your documents on the go. These five Google Drive tips will help you make the most of Google docs– both on your computer and off. P.S. Want to learn more about the Google Suite? We’ve got some videos just for you!